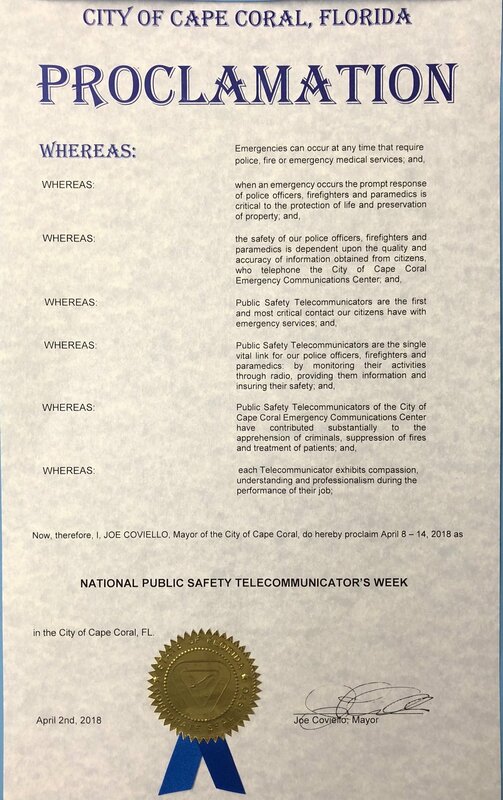 (April 12, 2018) - As part of the continuing celebration this week of National Public Safety Telecommunicators Week, Cape Coral Mayor Joe Coviello issued a Proclamation for the City of Cape Coral. On April 10th, Mayor Coviello visited the Communications Center at the Cape Coral Police Department located at 1100 Cultural Park Boulevard and issued his Proclamation officially honoring our dispatchers and telecommunicators for the amazing job they do every day. Commander Kristie Van Houten accepted the honor along with Communications Manager Tazkoma Burgoyne, Chief Dave Newlan, Deputy Chief Lisa Barnes, City Manager John Szerlag, and CCFD Interim Fire Chief Mike Russell. The Cape Coral Police Department thanks the Mayor and City Manager for their support of our telecommunicators, and also thanks community partners Publix and Wawa for their generosity and support of National Public Safety Telecommunicators Week.